As Americans, we're a pretty competitive bunch. We're never thrilled to see our country slip from the top spot of any standing. However, I'd venture to say we'd be downright giddy to give up the top spot, to China no less, when it comes to our oil imports. That's exactly what's on track to happen according to OPEC. The oil consortium now believes that China will overtake the U.S. as the top crude oil importer by 2014. According to the group's analysis, China oil imports are expected to top 6 million barrels per day this year while U.S. imports are expected to decline below 6 million barrels per day by 2014. We're really seeing a monumental shift in demand. However, the shift isn't completely due to China's voracious demand for energy. Last December, China's crude oil imports rose just 1.3% to 5.57 million barrels a day. What's changing is U.S. demand, which plunged 21% last year. Two main factors have contributed to plunging demand stateside. First, Americans have simply stopped driving as much as we had in the past. Overall, the annual driving per person has slipped by almost 8% since 2005. While the sluggish economy has played a role, it's not the driving force behind our driving less. Instead, there seems to be an overall shift in our driving pattern which by the end of the day has us using less gas. 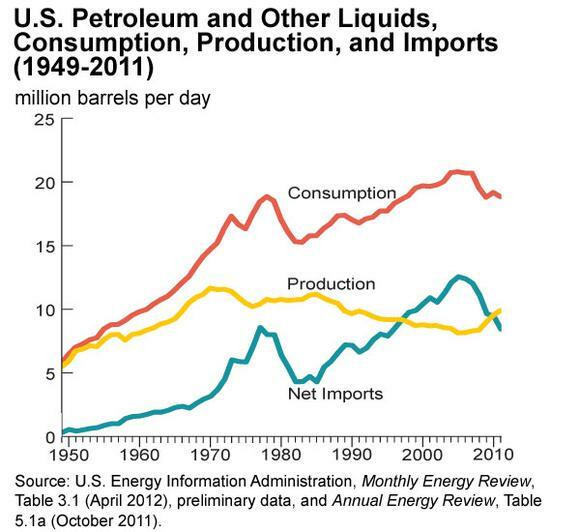 The other major factor contributing to the decline in our oil imports is the fact that we're producing a lot more oil. According to OPEC, "the shale boom in the U.S. is threatening to drastically reduce America's oil import needs." As an American, that statement should make you feel proud. Last year our domestic crude oil output rose to nearly 7.2 million barrels of oil per day, which is the most we've produced since the early 1990s. Overall, we produced 84% of our own energy needs last year. According to the International Energy Agency, we could become the largest global oil producer by 2020, while North America could be a net exporter of oil by 2030. We're simply seeing stunning production growth here in the U.S. In the Bakken, for example, Continental Resources projects that its production and reserves will increase threefold by 2017. Meanwhile, smaller producers like Kodiak Oil & Gas have seen production grow by triple digits every year since 2010. The company, which expects to drill 75 more wells this year, estimates that it can drill another 950 wells in the future. Other formations with significant oil resources are still emerging. In the Mississippi Lime formation of Oklahoma and Kansas, SandRidge Energy believes it can drill 11,000 wells over the next 18 years. The company more than doubled its production year over year and it has an ambitious plan to continue growing. Finally, more well-known production basins like the Gulf of Mexico continue to show they still have some life left. Just last month ConocoPhillips announced two big discoveries in the Gulf of Mexico. It's just one of many discoveries being announced offshore these days, with more likely to emerge. The energy industry recently bid $1.2 billion to explore 320 tracts of land covering 1.7 million net acres in the Gulf. The auction by the U.S. Bureau of Ocean Energy Management attracted 407 bids which showed continued strong interest in exploring for oil in the Gulf. While we still have a long way to go, we really are making great progress which could lead to energy independence. What's even more mind-blowing is that we could eventually begin to export our excess. As it stands right now, Cheniere Energy is poised to begin exporting natural gas by 2015. There are dozens of similar projects in the works which, if approved, could spur additional investment into growing our natural gas production. While natural gas exports are a hotly contested issue, just being in the position to export is a huge leap forward. While we might be slipping into second place in terms of oil imports, we're really sitting in the pole position when it comes to our energy future. Our best days as a nation really and truly could be ahead of us. That's why I'm excited for the day that China rises to the top of the heap when it comes to importing oil. Investors have an amazing array of opportunities to profit from this future. One interesting opportunity is SandRidge Energy. The company is focusing on growing liquids production, and for the first time in years its future looks optimistic. If you are unsure about the future of this emerging oil and gas junior and are looking to find out more about its strengths and weaknesses, then check out The Motley Fool's premium research report detailing SandRidge's game plan and what to expect from the company going forward. To get started, simply click here now! The article China Will Take the Top Spot That America No Longer Wants originally appeared on Fool.com. Motley Fool contributor Matt DiLallo owns shares of ConocoPhillips. The Motley Fool has no position in any of the stocks mentioned. Try any of our Foolish newsletter services free for 30 days. We Fools may not all hold the same opinions, but we all believe that considering a diverse range of insights makes us better investors. The Motley Fool has a disclosure policy.